US50 to SR350, lft.on Country Club, Rt.on Golfview, 3rd house on lft. Right on course, golf course that is! 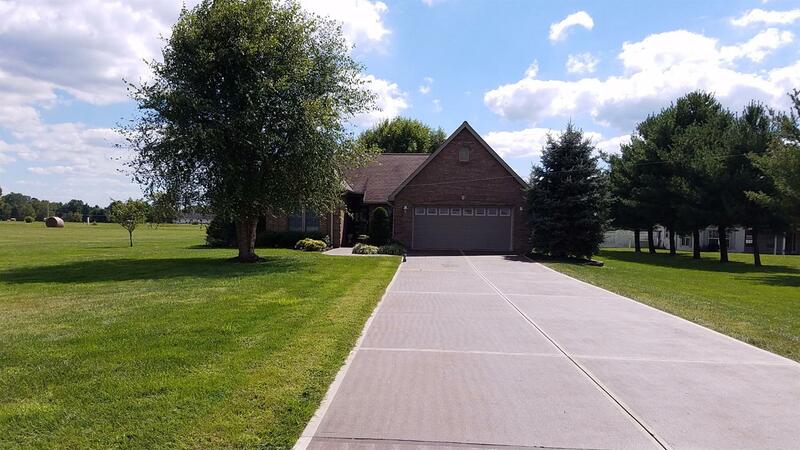 Stunning brick ranch with vaulted ceiling, fireplace, nice family rm with concrete patio & trex railing. Immaculate! Open concept, lrg kitchen with corian counter area for stools. Beautiful brick detail work, master bedroom has walk in closet. Kitchen has eat-in area, plus formal dining room.Low utility bills. NOTE: This property was sold on 5/10/2017 and is no longer available. The details listed below are believed accurate to the date of the sale and are subject to change. Milan (pronounced "MY-lun")	is the epitome of small town America. Tucked into Ripley County west of Lawrenceburg, Milan showcases rural living at its best. With a population of about 1200, tiny Milan is mainly a bedroom community for Batesville and Cincinnati workers. With its slower pace and focus on country living, you'll have a chance to know everyone in town. Named for the city in Italy, the city's name came from German settlers who focused on grape culture and processing of wine. Today a small winery still operates south of town. During the 1800's the village grew and was referred to as a substantial business center and an active Underground Railway Station of Antebellum days. Milan was also on the route followed by Gen. John Hunt Morgan and his Confederate Cavalry in 1863. Downtown Milan isn't much more than a crossroads now, with little more than memories of its famous spot in sports history. The high school's championship-winning basketball team of 1954 inspired the 1986 movie, "Hoosiers". You will find more than just memorabilia of the 1954 State Basketball Championship at the Milan Museum. A display showcases the areas history about a farm community developing from the early 1800's through 1954 and on into today. You'll need to meander some quiet country roads to reach Milan, located at the junction of St. Rt. 101, and St Rt. 350, about 45 minutes from Cincinnati. sMilan businesses feature all the necessities, and a shopping strip containing several specialty stores. One of the local restaurants offers bed and breakfast to travelers and Milan also boasts its own winery. Milan residents have worked to develop a community park in which area children can play baseball, picnic, or fish. Milan is one of the few towns in the county that celebrates the Fourth of July with a giant fireworks display, a parade and numerous other fun activities for the family. Golf enthusiasts can enjoy their favorite game at the Lakeside Golf Club, a public golf course with a clubhouse and restaurant, pro shop, and practice area. Tourists like to drive the John Hunt Morgan Memorial Trail, following in the footsteps of the Confederate Calvary route through the area. The former Army site, Jefferson Proving grounds offers nearby recreational access.